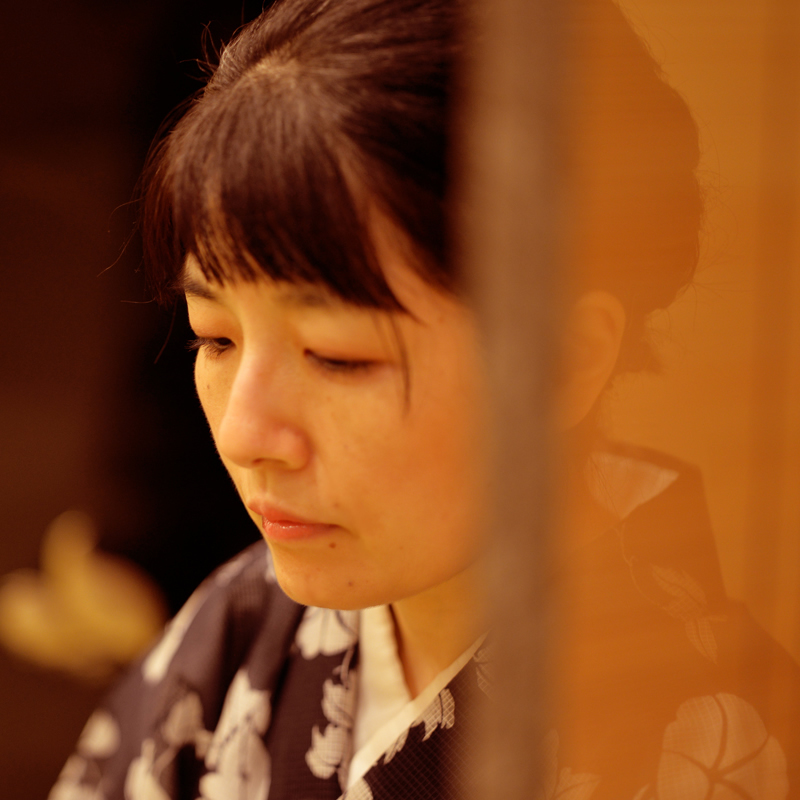 How can the beautiful “dyeing” of a kimono be expressed in a painting? I was experimenting with this idea using various Japanese painting materials when I saw works of Ukiyo-e and was immediately drawn to the beauty of the “printing” that had no color spotting or irregularities. I thought that the technique had commonalities with stencil dyeing used in kimono, and this is what led me to apply to the Adachi Contemporary Ukiyo-e Award. This spring, I won the grand prize and my dream of seeing my own work in the world of woodcut prints expressed through minimum lines and beautiful planes came true. Yu Miyazaki explored the world of woodcut prints for the first time as a contemporary Ukiyo-e artist. The contours of a woman are drawn using simple lines. A beautiful peony pattern printed on a light cotton kimono using a dyeing technique called “shoen-zome,” which uses soot from burned pine wood. 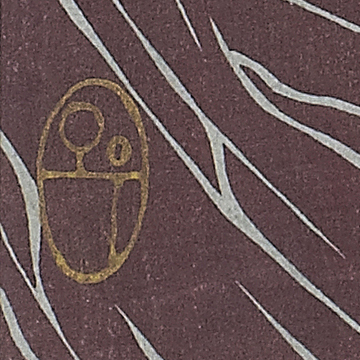 The woman's hair is depicted with smooth lines unique to woodblock prints. 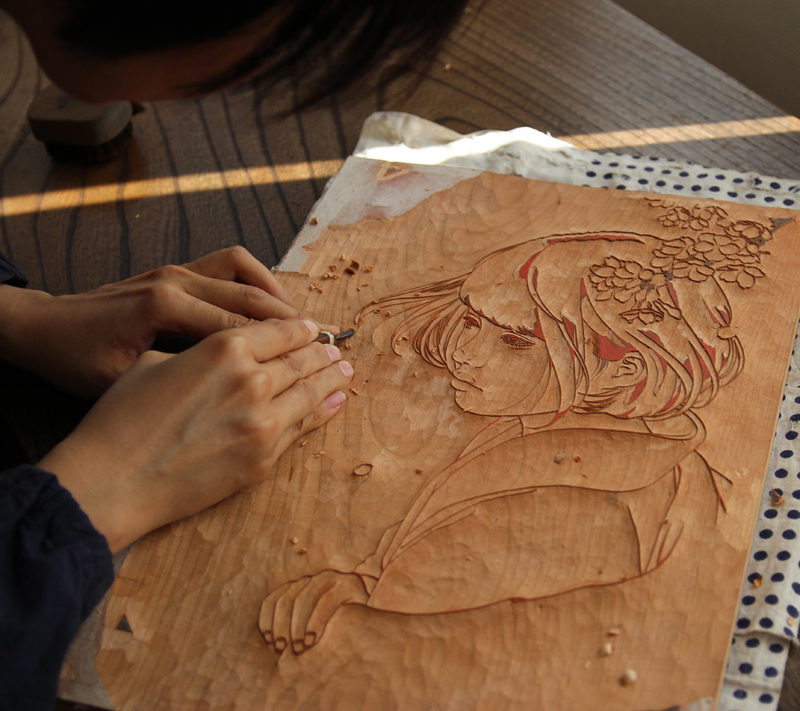 Woodblocks carved to faithfully produce the soft and elegant brushstrokes of Ms. Miyazaki. 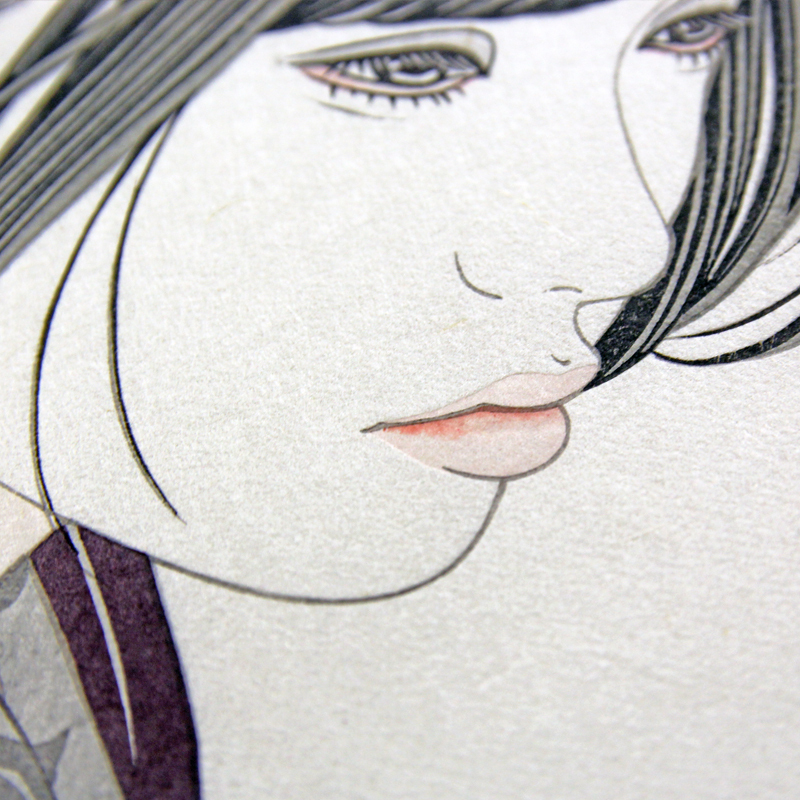 Like the bijin-ga produced by the Ukiyo-e artist Utamaro, the skin on the face and hands are expressed by making use of the soft texture of the washi Japanese paper itself. Ms. Miyazaki's seal is placed on the lower left corner of the picture. 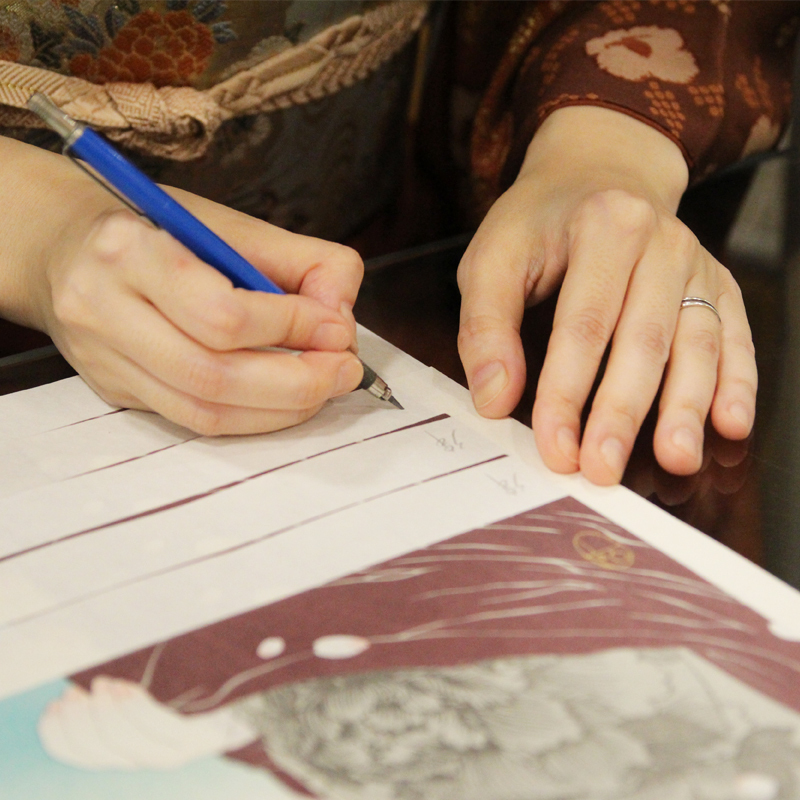 A signature in Ms. Miyazaki's own hand is written in the margin. 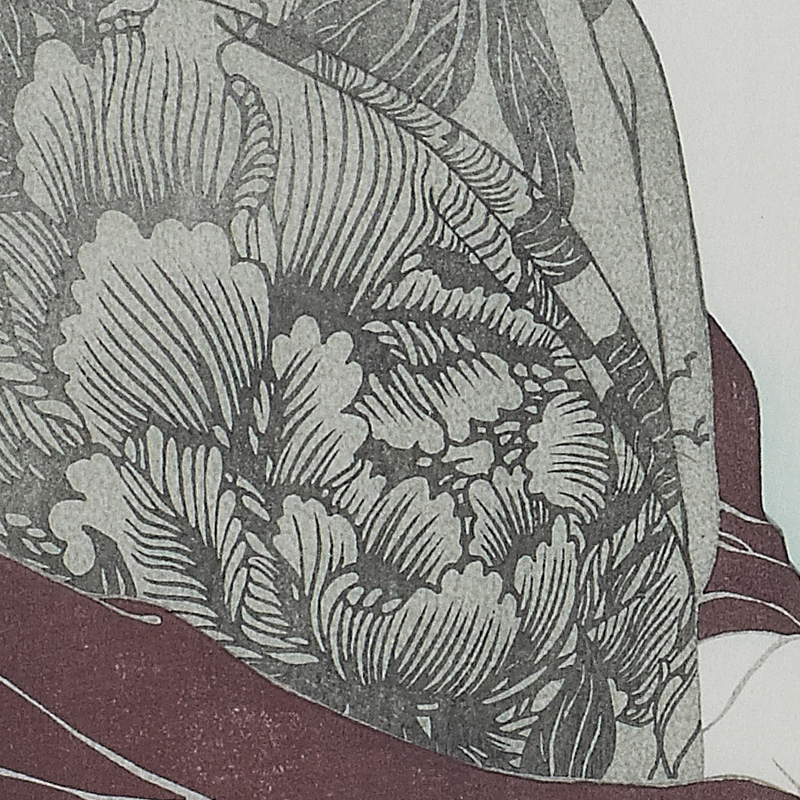 One of the attractions of Ukiyo-e prints is the beauty of simplification. 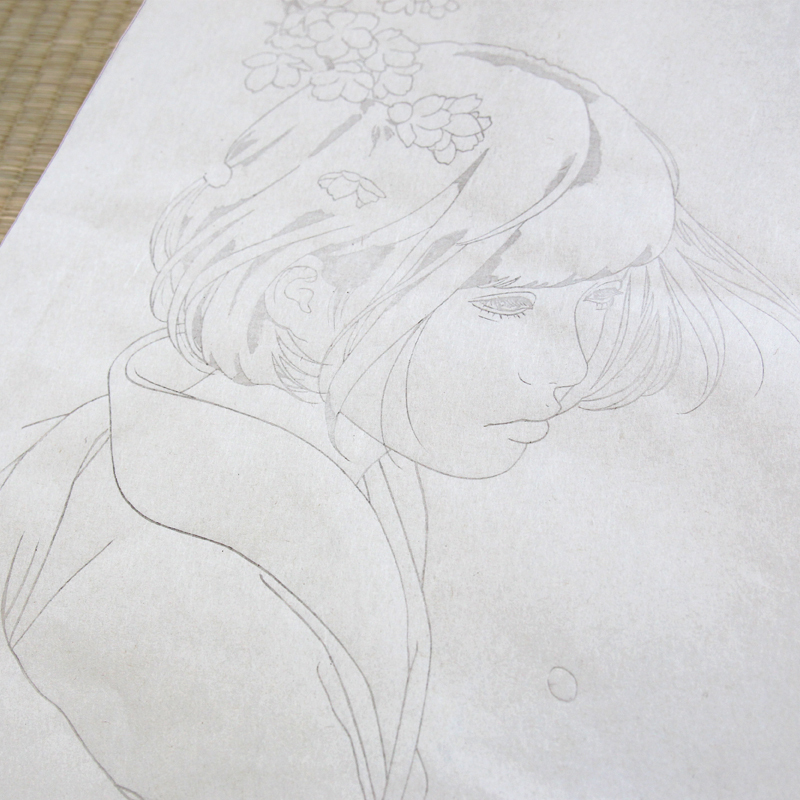 Ms. Miyazaki pursued the beauty born from simple lines as she produced the original painting for the Ukiyo-e. 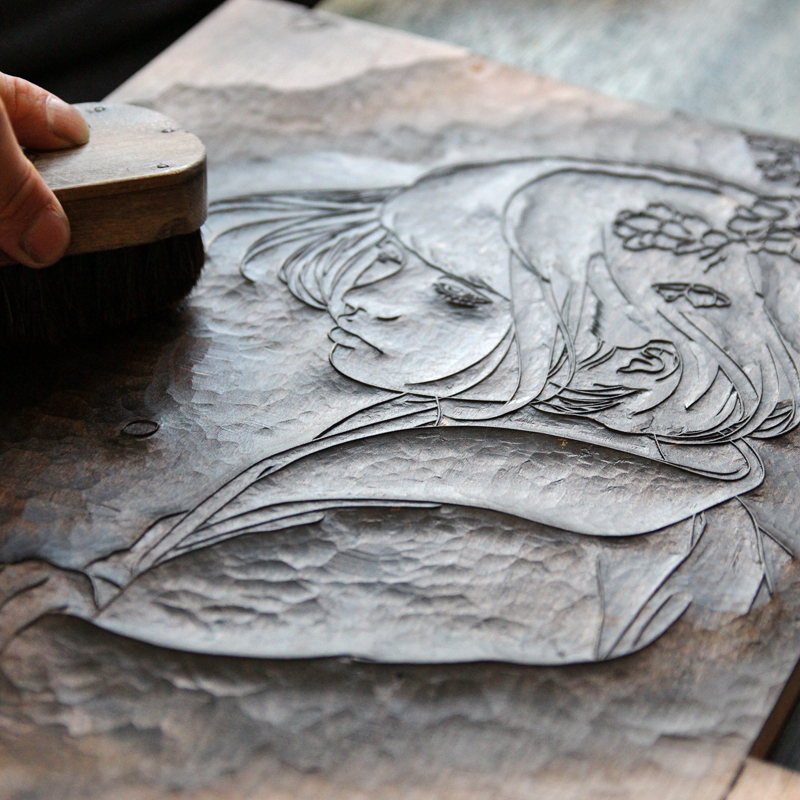 The carver stays close to emotions expressed by the artist, breathing life into the delicate lines. In Ukiyo-e, portraits of beautiful women called “bijin-ga” are created without coloring parts such as the face and hands where the women's skin is shown. 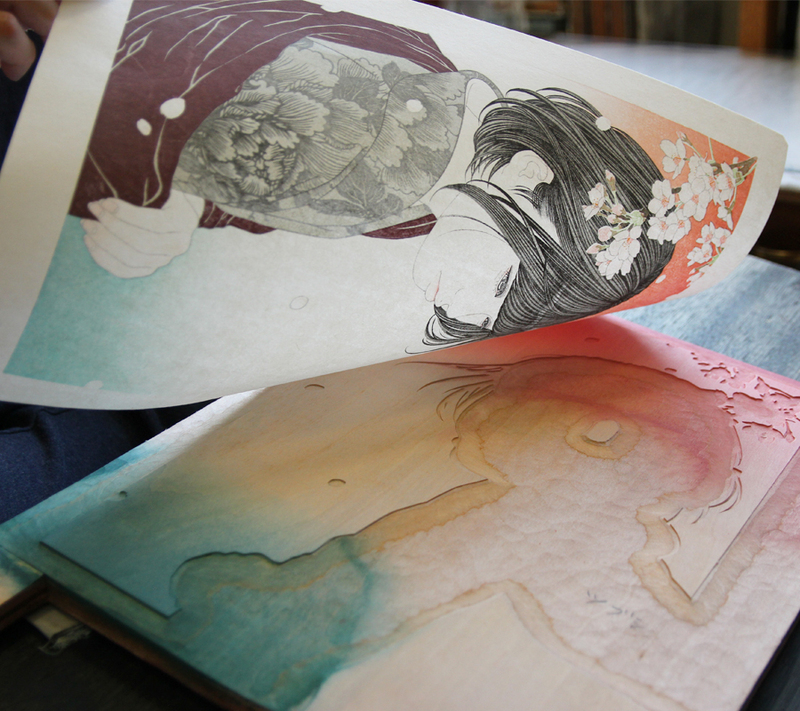 Instead, the skin is expressed by making use of the soft texture of the washi Japanese paper itself. 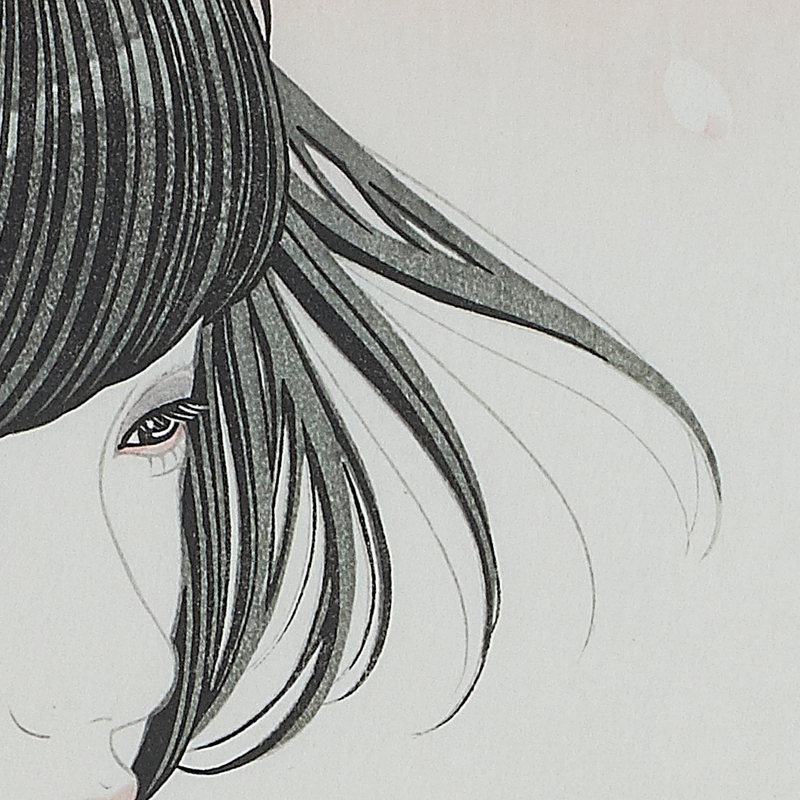 The thin black ink used to show the delicate contour of the face and the pale pink of the lips combine with the soft texture of the paper to create the sensual expressions of the woman. Born in Osaka in 1973. Graduated from the art department of the Osaka Prefectural Kohnan High School. Yu Miyazaki held her first solo exhibition in 2011. 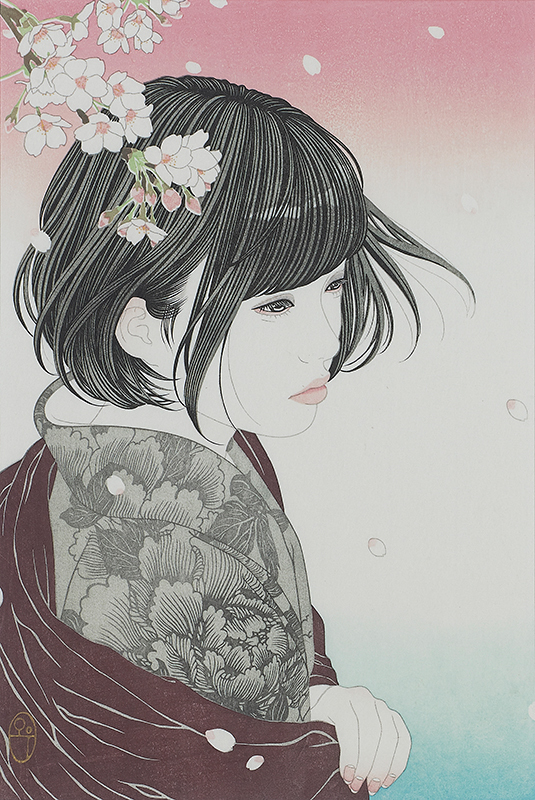 The artist continued to produce works using various materials including pencils, colored pencils and acrylic paints and started studying and producing Japanese-style painting on her own from 2015. She released bijin-ga works repeatedly, and was included in the book entitled bijin-ga zukushi” (collection of bijin-ga) in 2016. 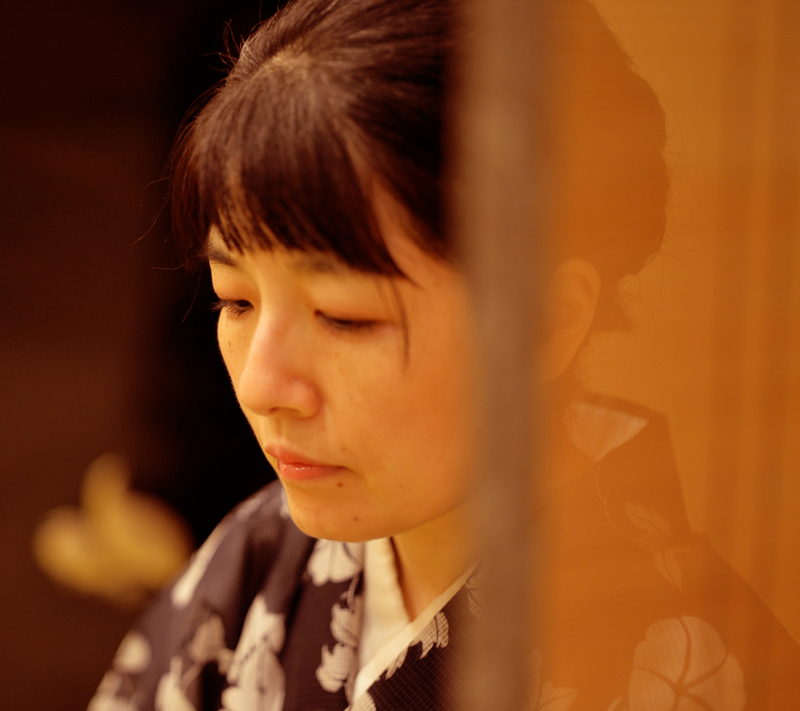 In March 2018, she received the grand prize at the 9th Adachi Contemporary Ukiyo-e Award. The Yu Miyazaki exhibition Kizashi”(“Signs”) will be held in October 2018 at Gallery Art Morimoto. She is an independent artist with no affiliations.